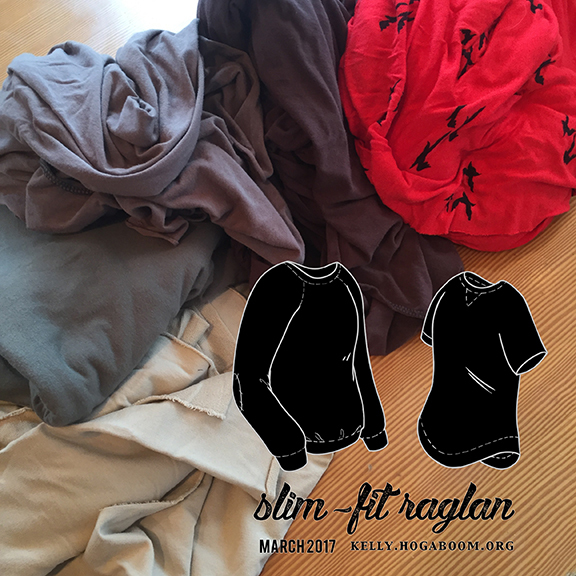 Thank you for joining us for our Patterns for Pirates Slim Fit Raglan sew-along! To recap: I posted a bit about the pattern and supplies a month ago. 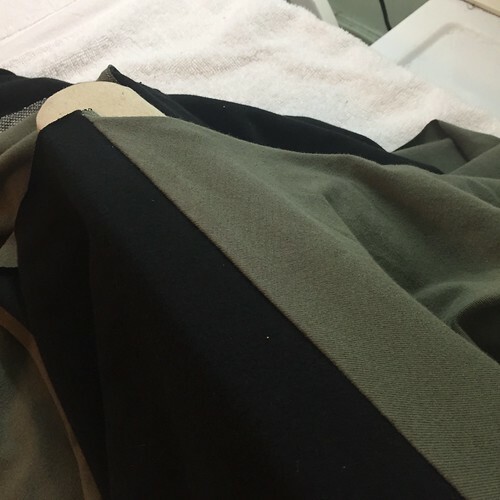 On the 15th, we cut and marked our fabrics. Then, we created our triangle patch and our elbow patches. 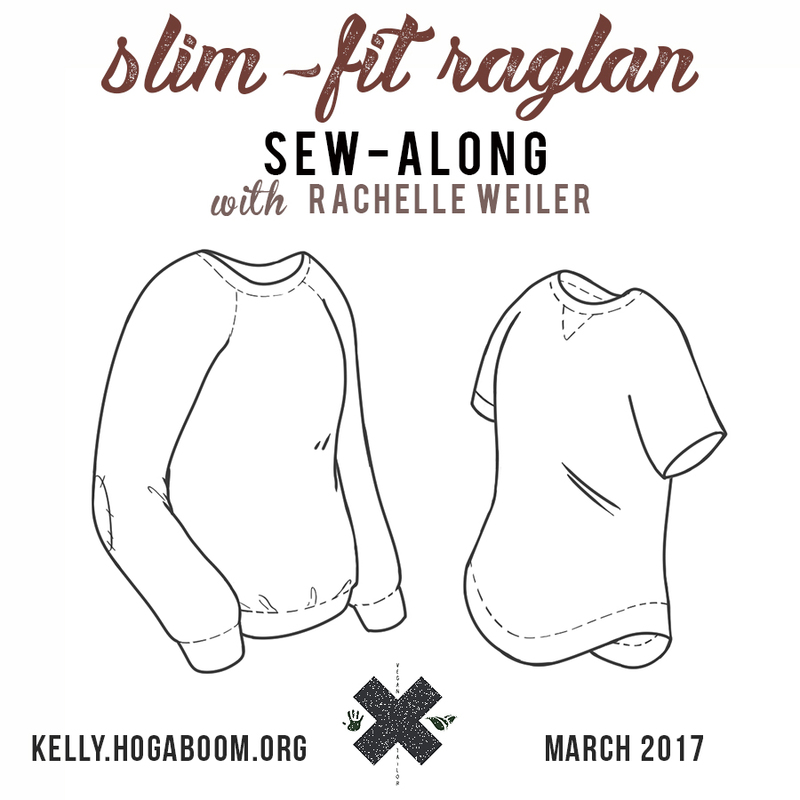 Today we’re creating our side seams and neckband (page eight through ten in the pattern)! Remember – if you have any questions, you can post them here, email me, or message me through Facebook (either my personal page, or my sewing page – The Vegan Tailor). I want to make sure to help everyone who is participating, to have great results. So today, we get to install our sleeves, side seams, and put that neckline in! As I mentioned earlier, neckbands can be very tricky. This is almost always due to either general inexperience with knit fabrics, or a neckline band that is too small or too large. I will talk more about neckline bands after we finish our general shirt construction! 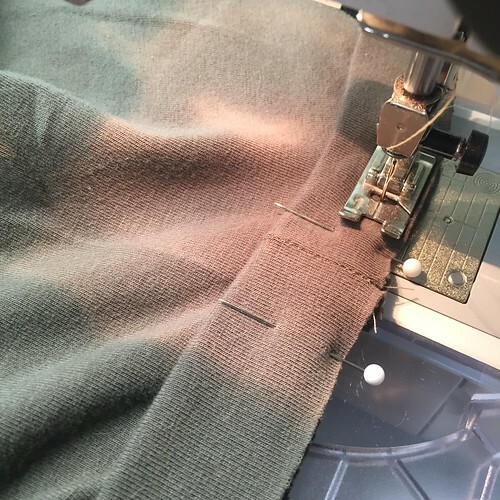 So first, we get to stitch up our sleeves – four seams in all (page eight of the pattern), at 1/2″ seam allowance. 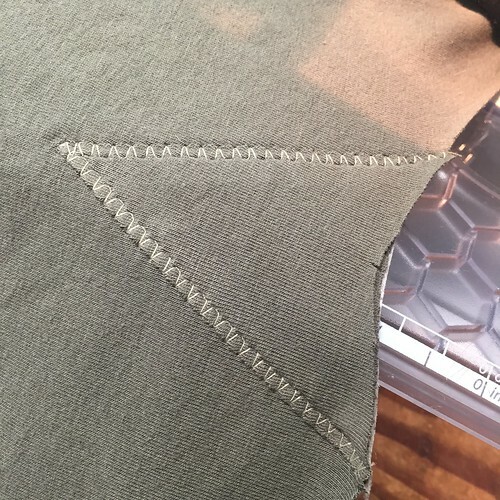 Place each sleeve seam against the shirt arm seam, right-sides together. If you recall, I use safety pins to denote the right-side front of my shirt body and my sleeve pieces. 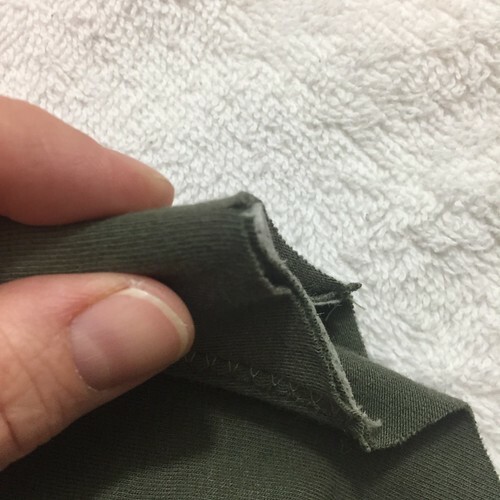 In the case of these four construction seams, I used the lightning bolt stitch (for strength), then sewed another lightning bolt 1/8″ away, and trimmed the seam allowance. The result is a very pretty, strong finish. 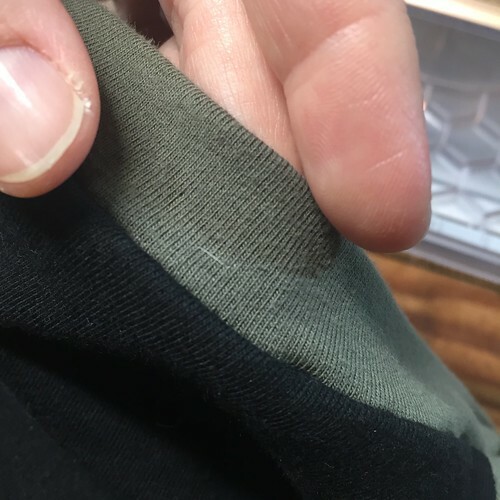 Go ahead and lightly steam-press these seams to either the sleeve or shirt-side. I pressed to the sleeve side for all four. 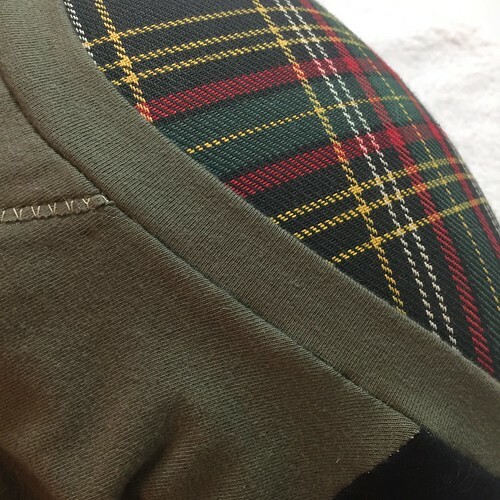 I tend to like this seam pressed to the sleeve side, but it’s also never a bad idea to press to the darker fabric (this is a quilter’s method). Pin and sew the side seams identically (top of page 9), finishing the seams and lightly pressing them toward the back of the garment. Time to sew up that neckline! 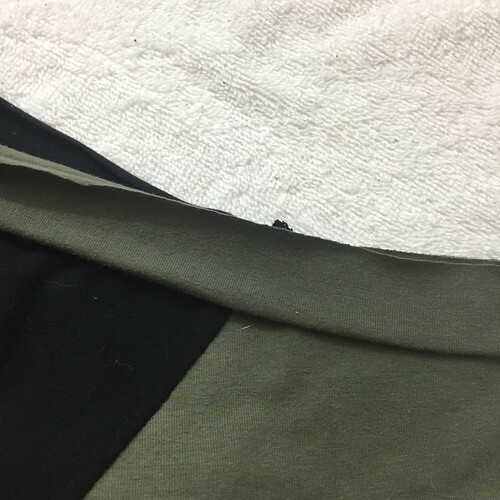 So, you can of course cut the band exactly as the pattern details. 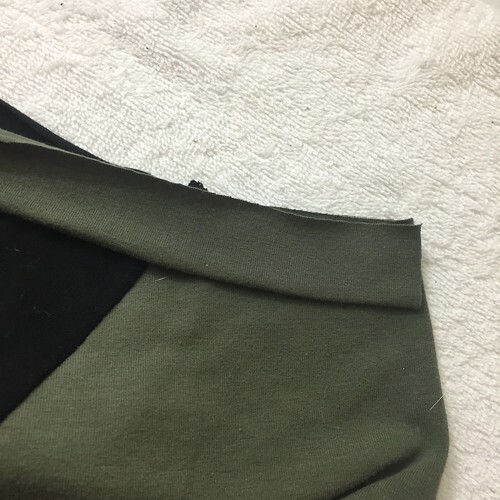 However, sometimes – especially if our band fabric has less stretch than recommended in the pattern, we might want to cut a longer band, as I did. 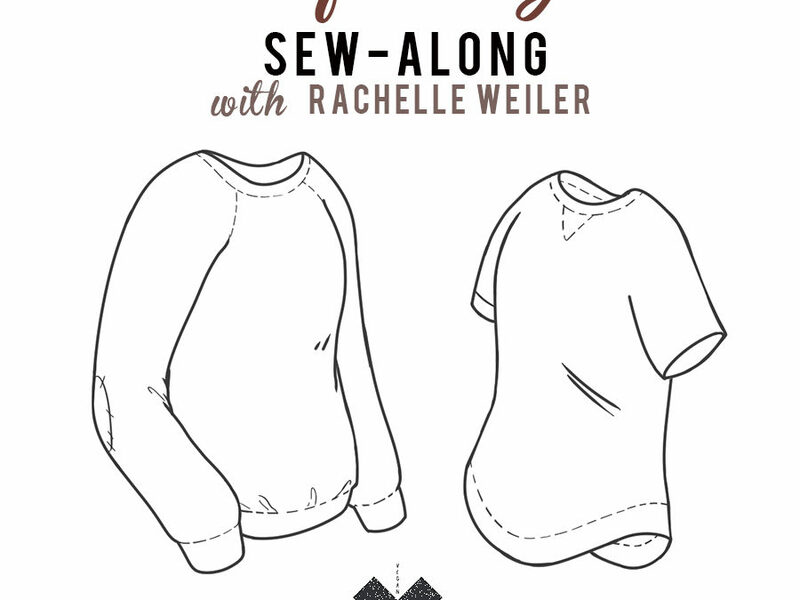 Fold the shirt body at both the center front and center back of the neckline. Lay this shirt on the ironing board. Keep steam-pressing! This band will be a little less “snug” – more of a jewel-neck than a crew neck – but will lay beautifully. When you reach the center front, simply mark this center mark on the band, remove the shirt carefully, and press that second half of the band exactly like the first half. When you have your entire band shaped, cut the remainder off, and sew the two short edges together (bottom of page nine, in the pattern). 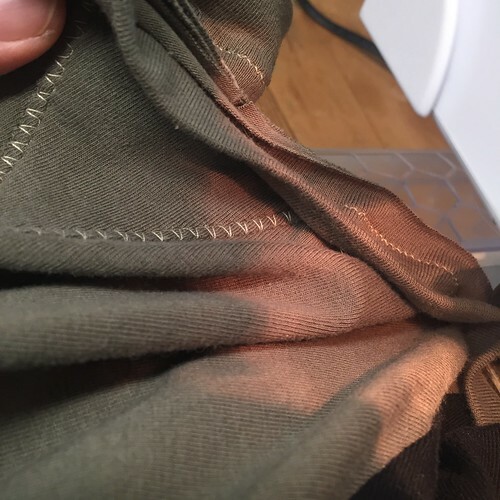 You can use a bit of stabilizer when sewing this seam. 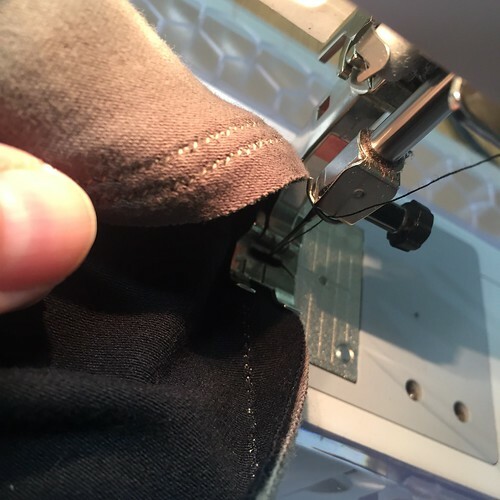 Finger-press or steam-press this seam open, making sure not to distort the curve you carefully applied. Now, pin that band! 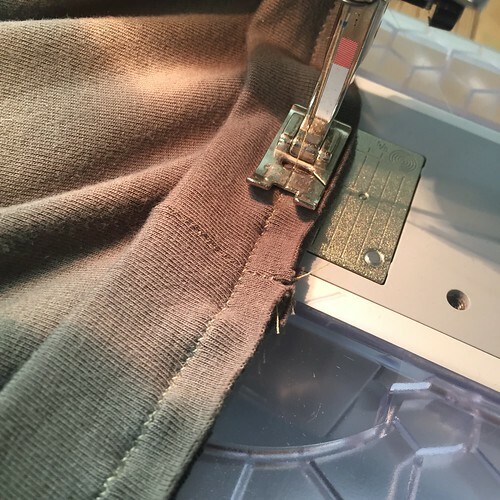 You can pin the back band seam to the marked center back, and pin the marked front center of the band to the marked front center of the shirt, then distribute the band evenly around the rest of the neckline. 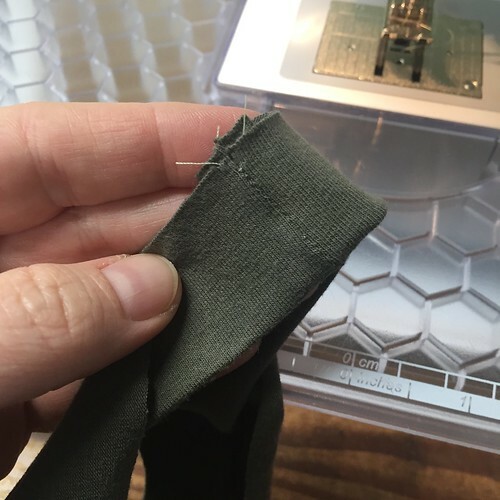 Since the band is gathering the shirt, make sure to pin with the band up, so that you sew with the shirt against the feed dogs of the machine. 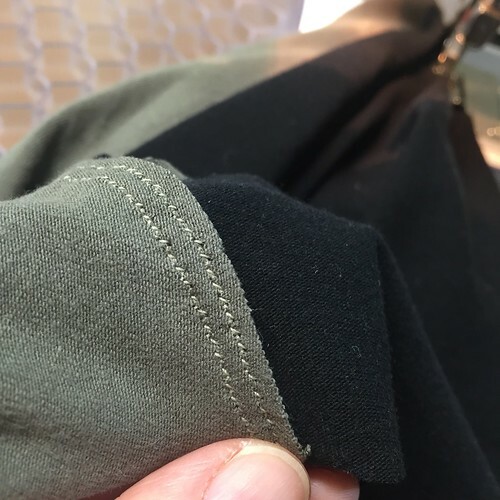 If you are feeling at all funky about this band experience, you can first baste the band to the neckline, 1/16″ inside of the stitching line. 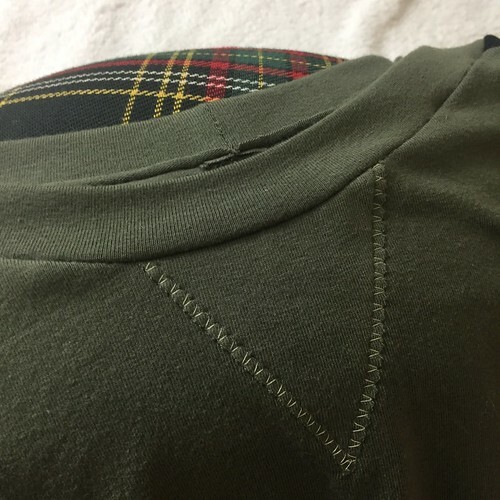 After this basting, check there are no gathers and that the band looks even, then stitch the band to the neckline using a strong stretch stitch (page ten), and remove the basting stitches. I finished this seam just like the shirt sleeve seams: with a second lightning bolt stitch, and then a final trim. Shown below, the band after finishing and trimming, but before pressing. Notice the perfect on-grain band placement! 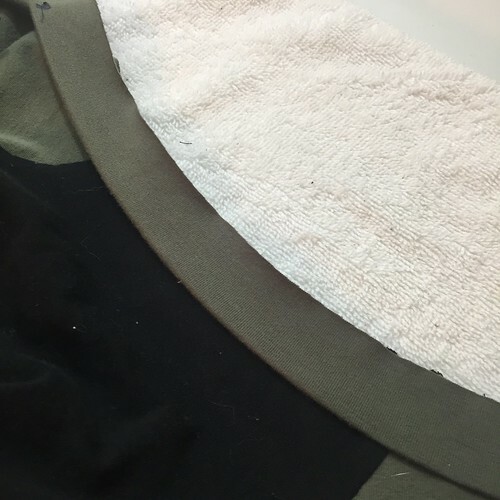 This makes a real difference for a neckline that doesn’t ripple. Now, bring your neckline to the ironing board and gently steam-press the seam allowance down. 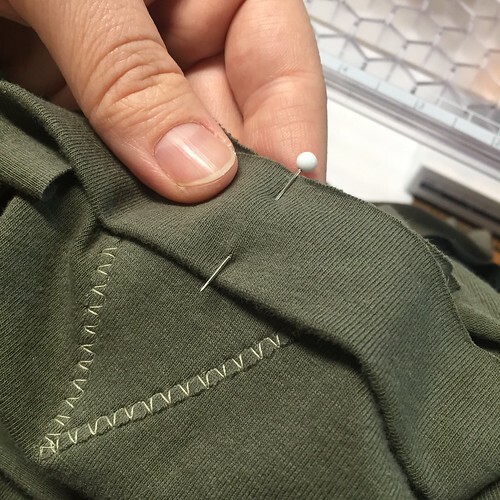 If you want to topstitch, you can. You can use a twin needle and topstitch straddling the neckband seam, or stitch single stitch to catch the seam allowance to the shirt body. I elected not to topstitch. I’ll see you on the last post, on the 21st – when we finish our sleeves and shirt hem! In the meantime if you have questions you can email me, comment here, or find me on Facebook (on my personal page or at The Vegan Tailor)!